St James' Roman Catholic Church Spanish Place is on the northern side of George Street, close to Marylebone High Street. In the late 1600s the bishops of Ely let St Etheldreda Ely to the Spanish ambassador. After the Restoration, a new chapel was built on the corner of Spanish Place and Charles Street (now George Street). In 1827 the official Spanish connection ceased and the leased land lapsed. In 1890 the present church was built immediately opposite the old chapel. Hinde Street Methodist Church is on the north-east corner of Thayer Street and Hinde Street. The first chapel on this site was opened in 1810 by members from Chandler Street Methodist Chapel (just south of Oxford Street and now apparently lost). It was described as one of the ugliest chapels in Methodism but survived possible closure in 1850. 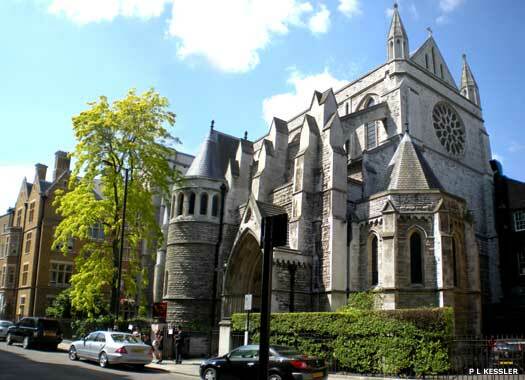 In 1887 the present church opened on the same site and was described as the most handsome chapel in London. St Mary Parish Church stood on the corner of Marylebone Lane and Tyburn Lane (now Oxford Street). The church was built in 1200 but no description of its appearance seems to have survived. It was probably a typical Norman stone church. It was demolished by about 1400 and replaced by a new St Mary's Church built at the northern end of Marylebone High Road. 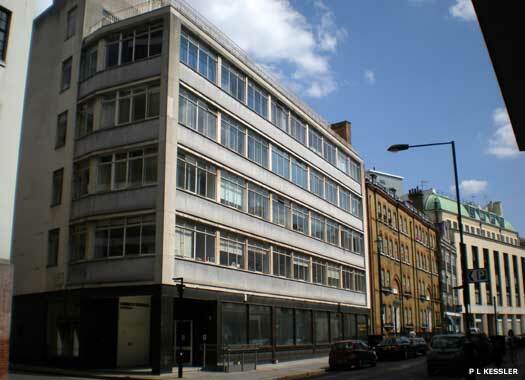 This was also later replaced, by the present St Marylebone Parish Church on Marylebone Road. St Peter's Church Vere Street stands at the south-east corner of Vere Street and Henrietta Place. The church was opened in 1724 as Oxford Chapel, built by Edward Harley, Second Earl of Oxford, to a design by James Gibbs. 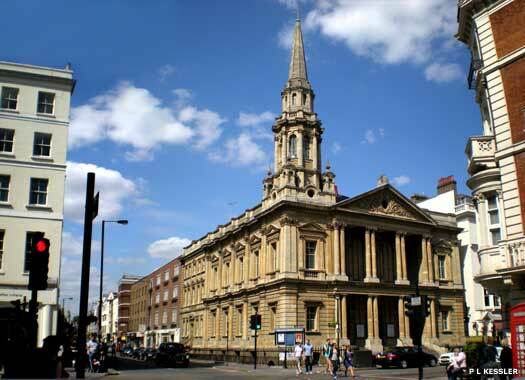 More usually known as Marylebone Chapel, in 1952 it became a chapel of ease, attached to All Souls Church Langham Place (see below). In 1983, once deconsecrated, it became the home of The Institute for Contemporary Christianity. Castle Street Welsh Baptist Church (Eglwys Gymraeg Canol Llundain, in Welsh) occupies a narrow three-storey plot midway along the northern side of Eastcastle Street, almost opposite Winsley Street which connects to Oxford Street. The church was built in 1859 by the London Baptist Association, but it may have been rebuilt in 1889, as this date is carried on the front of the building. Heavily decorated and ornamented at the front, it seats at least four hundred persons. 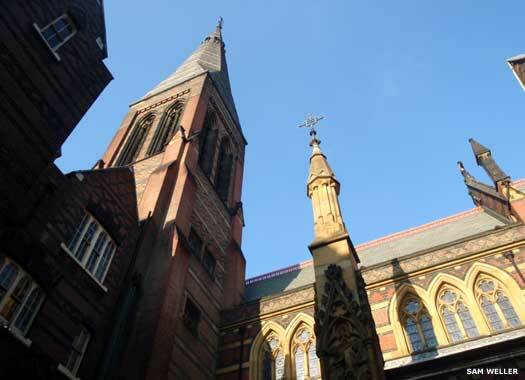 All Saints Margaret Street stands in a confined plot on the northern side of Margaret Street, midway between Great Titchfield Street and Wells Street in Fitzrovia. 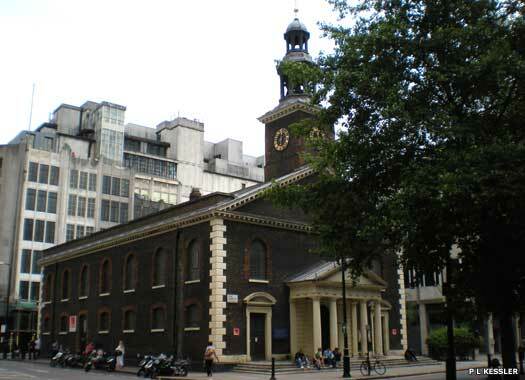 Margaret Street Chapel was built on the site in 1788 as a meeting house for Lady Huntingdon's connection. The present Gothic church was built in 1859 by the architect William Butterfield. It is hailed as one of the greatest expressions of the Gothic Revival, although little of it is visible from the street. 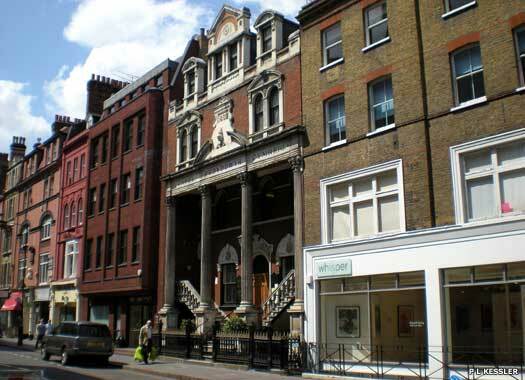 The Jesus Centre is on the south-west corner of Margaret Street and the narrow Marylebone Passage, almost directly opposite All Saints Margaret Street (see above). 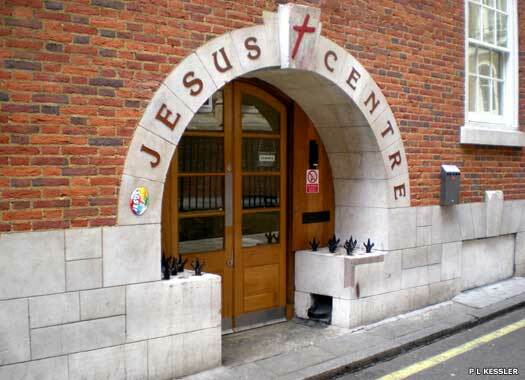 Established in 2002, most Jesus Centres are places in which the local Jesus Fellowship Church (known also as the Jesus Army) meets and worships, with a daily programme of church and social events. They also heavily promote working with disadvantaged groups created by the failings of modern society. 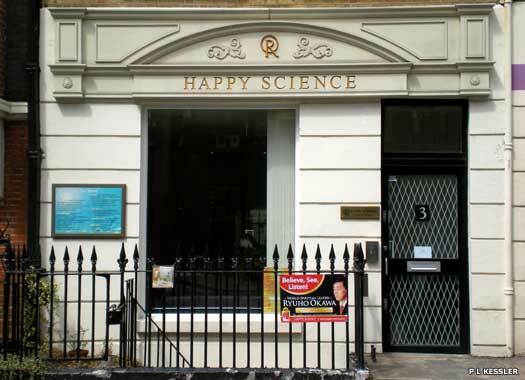 Happy Science stands on the northern side of Margaret Street, opposite Marylebone Passage. Happy Science was created in Japan in 1986 by Ryuho Okawa a former student of law and finance who founded his own religion. He claims to be a reincarnation of Buddha, and offers the road to eternal peace. 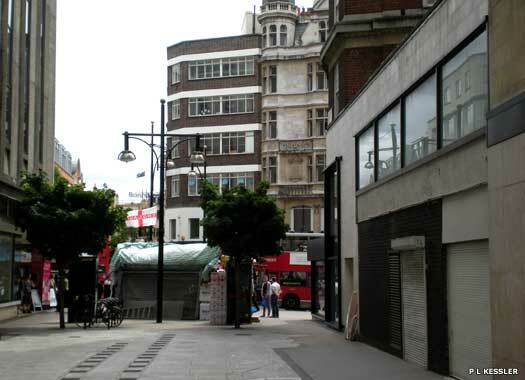 The cult has at least thirty-two temples in Japan many others internationally, including this one in London. Its original name, Kofuku-no-Kagaku, was Anglicised in 2008. St Andrew Wells Street formerly stood at the south-east corner of Wells Street and Booth's Place (on the left of this photo), the latter leading to Wells Mews. The church opened in 1847. 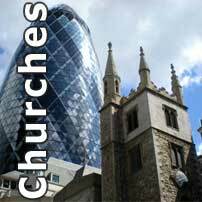 In 1932 it was closed, deconsecrated and dismantled so that it could be re-erected as St Andrew Kingsbury in Wembley. Nearby was Providence Chapel, a place of worship for Independents. The building was destroyed by fire in 1810 and the site became a timber yard. 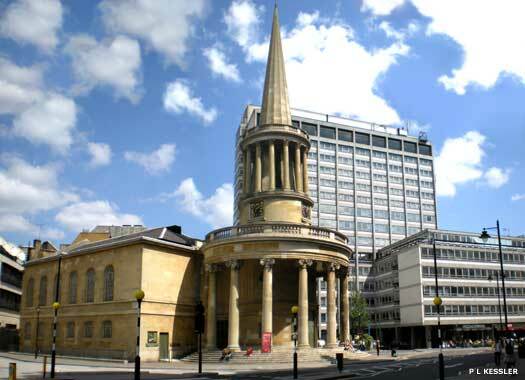 The Church of All Souls Langham Place stands on the eastern side of Regent Street, between Riding House Street and Langham Street, and next to BBC Radio House (to the left of the photo). The church was designed by John Nash to complete his scheme for Regent Street. It was consecrated on 25 November 1824, bombed on 8 December 1940, making it unusable, and re-opened for worship on 29 April 1951. Major reconstruction work was undertaken in 1975. One photo on this page contributed by Sam Weller.